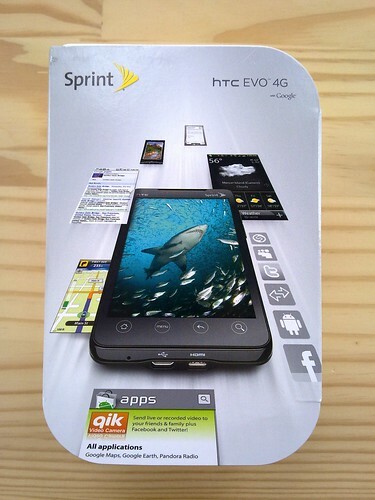 Move over HTC Incredible, the HTC EVO 4G is here! It’s almost the perfect device. The only thing missing is an unlocked GSM radio for 3G (instead of CDMA) – that and 4G service in San Francisco. Update: Enjoy part 2 (with first impressions and more), and my camera review. Actually, no… The HD2 only shares the screen and processor with the EVO 4G. The Incredible shares the processor, camera, radio (CDMA) and operating system (Android 2.1 with Sense), as well as a similar industrial design (black outside and red inside). Not to mention, I currently have an Incredible floating around, but no HD2! I’m wondering what they were thinking by using text for “MENU” button instead of the classic icon. Guess its that way on every current HTC. BestBuy told me they are not charging the extra $10 in Denver until the 4G is up and running. Sprint told me that the Android 2.2 update will be available in JULY. So about a month after it comes out.